I am really hoping that’s the proper Gaelic translation for “Me Like Eat” up there. 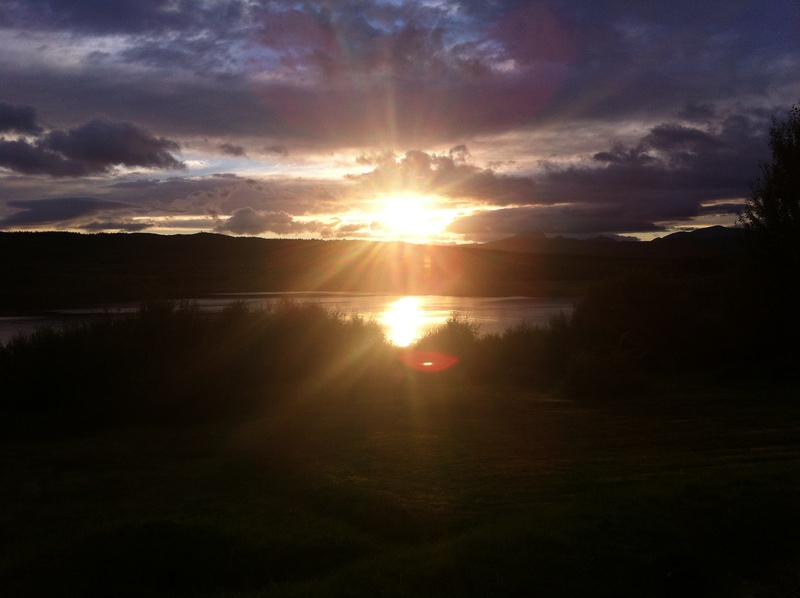 Meanwhile, that’s a sunset on Skye. I can say without any hesitation whatsoever that by far one of the most beautiful places on Earth I have ever been is Isle of Skye, Scotland. It is devastating, haunting, unspoiled, ancient, mystical, remote and wonderful. Let’s talk a little about what makes Skye so beautiful. To start with, it is a fairly large land mass considering the number of people who live on it. One not-so-reliable source says there are some 10,000 people living on its 639 square miles. To give you a counterpoint, the same source says New York’s Long Island has about 8 million people living on its 1,401 square miles. So for half the size of Long Island, there is a fraction of the people living on it. Hardly the best photo of the place, but still. I mean, come on. Driving to Skye from mainland Scotland is incredibly beautiful. You drive past Eilean Donan Castle (much better pictures here) and go on a bridge over Loch Alsh to get onto the island – that is, if you don’t use the ferry. It is a spectacular drive. Just pure magic. In addition to its tremendous, unspoiled natural beauty, Skye offers (like everywhere else in Scotland) quite a few tourist attractions. My wife and I stopped in at Dun Beag Broch – a roughly 2,000-year-old fortification with a magnificent view of Loch Bracadale. There’s also the Talisker Distillery, the only distillery on Skye, and the island’s main town, Portree. But for all of this, the island is not exactly the type of place where you’d think “Let’s put one of the world’s truly great restaurants here.” Even if you did think that, you might think to put it in some place like Portree or some other, obviously accessible place. Dunvegan Castle sits overlooking the water. It takes about 90 minutes or so to travel either of the two main, windy roads that run tip to (more or less) tip on the central part of Skye. 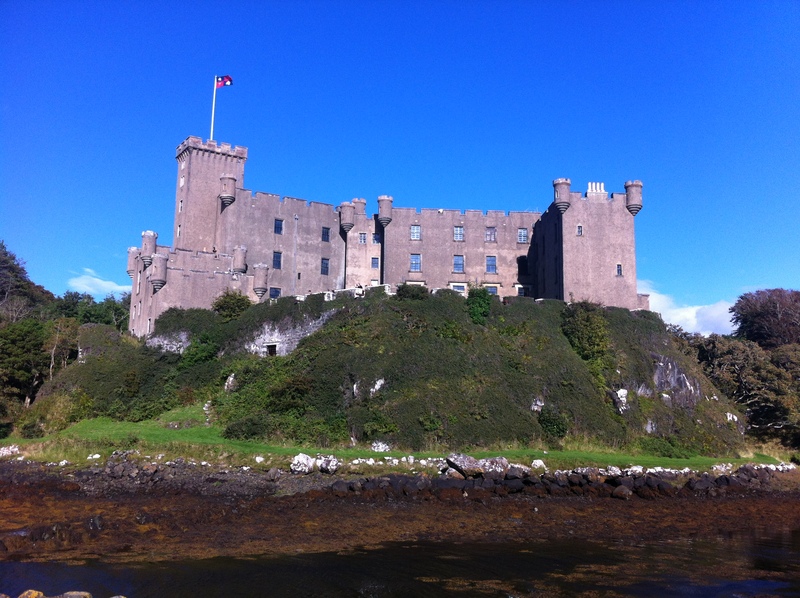 One takes you around its Eastern coast, the other the West, meeting at a point near Dunvegan, where of course there is another remarkable castle, seen above, the home of Clan MacLeod. Driving down this one-lane road is part of the fun of attempting to find Three Chimneys. The restaurant isn’t even in Dunvegan, but near it, and requires traveling down a one-lane road to get to. It is in the back of the back of the beyond. As you can see, when confronted with an oncoming vehicle in the one-lane road, it is necessary to make use of the little outcropping “passing place” that dot the road to allow yourself or the traffic by. These signs are your friend. 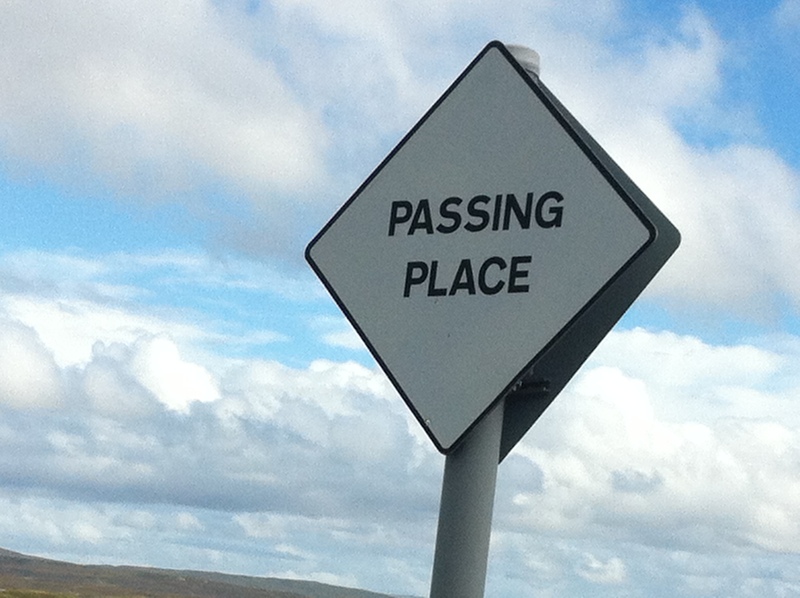 How do you find the place? 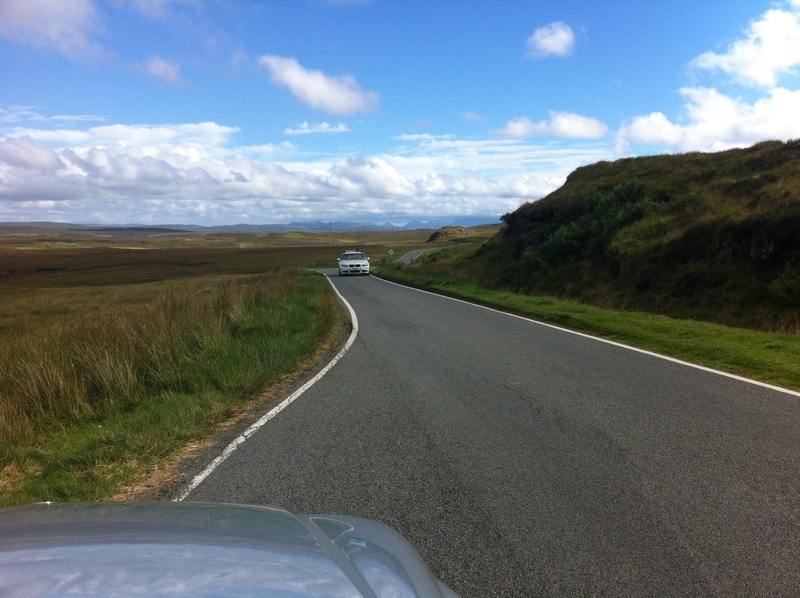 Good luck – our GPS didn’t know where it is, and if you do start down this one-lane road, you will no doubt think you have gone too far without seeing it for your own comfort. 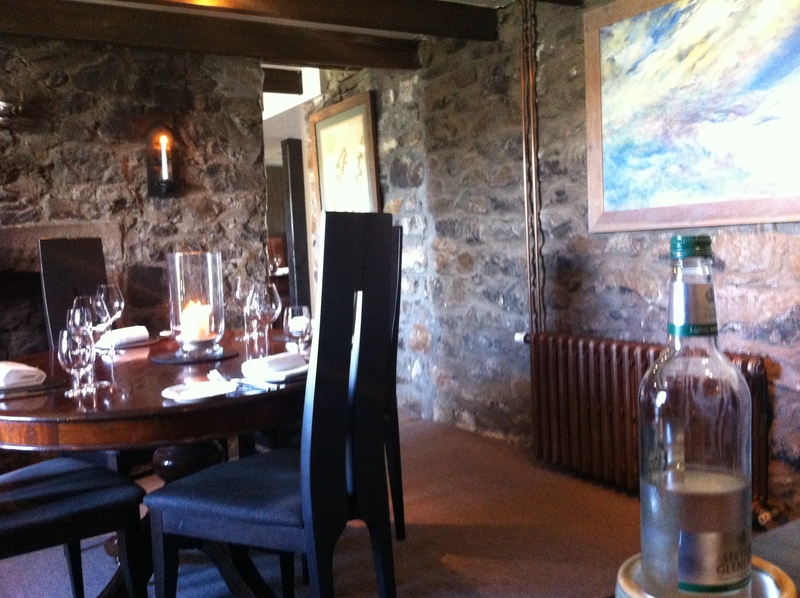 After a wrong turn or two, eventually you may be lucky enough to stumble upon the Three Chimneys Restaurant. There’s a small parking area, and the owners have sensibly attached a few cottages for weary guests to stay next door. Needless to say, book both your table and room (I imagine) well in advance. We were lucky enough to secure a lunch table reservation on the day of our visit. It was busy for lunch – some other folks were turned away for lack of a reservation. If I had come all that way to be turned down I’d be livid, so do make a booking. We were seated in what I believe is one of two or three small rooms. This room had a booth, a central table, and a table along each of two walls. It is not spacious. As you can see there’s a rustic vibe to the place, with its stone walls and exposed, rough-hewn beams running across the ceiling of the dining room. There are no white tablecloths for lunch, but the staff are all wearing tip-to-toe black outfits. I am sorry to say that I found our booth, over time, to be not all that comfortable. The cushion was somewhat anemic and the wood it sits atop unforgiving. But this is a minor niggle. We ordered sparkling water for the table. On Skye, the water (at least where we were staying) is peaty, with a brown hue. It’s delicious and safe to drink but doesn’t make for an elegant presentation. I don’t think it would be for everyone. If you like whisky, though, do yourself a favor and sip some of the peaty water, it will change how you taste whisky forever. A tasty way to start the meal. 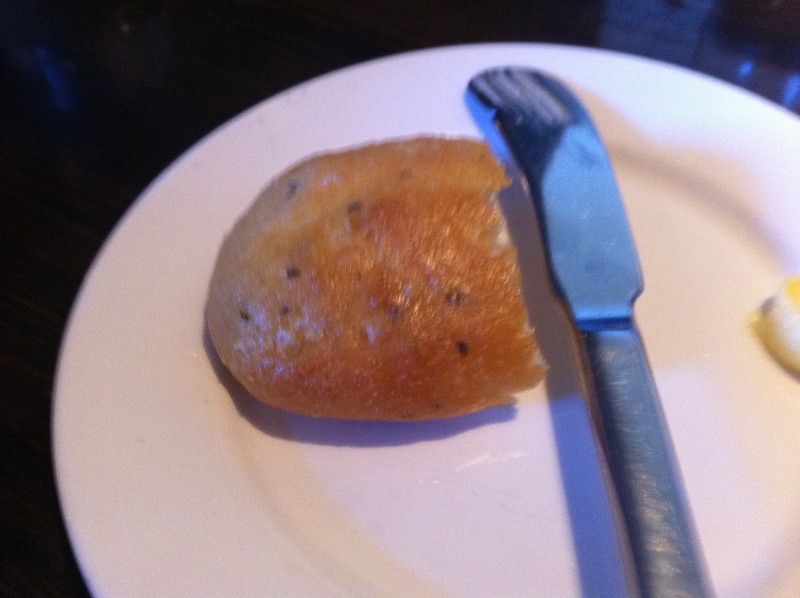 We began with a selection of breads, opting for the rosemary and sea salt, which was warm, fresh and delicious. Savory. Now for lunch, they offer a two or three course version. We had dinner plans lined up for later in the evening, and although the dessert course looked very promising (the hot marmalade pudding is apparently the stuff of legend and rumor), we opted for the two course version to start with the option to expand to a third. The two course lunch clocked in at a little less than £30 each, and I opted for a single glass of Pinot Noir as well. Far more there than meets the eye. My first course was an Isle of Skye shellfish bree. The maitre d’ explained that this consisted of whatever is freshly caught essentially “down the way.” As was previously mentioned, Skye is unspoiled, so it is quite easy to fathom that these folks still can practically pluck fresh shellfish out of the sea. 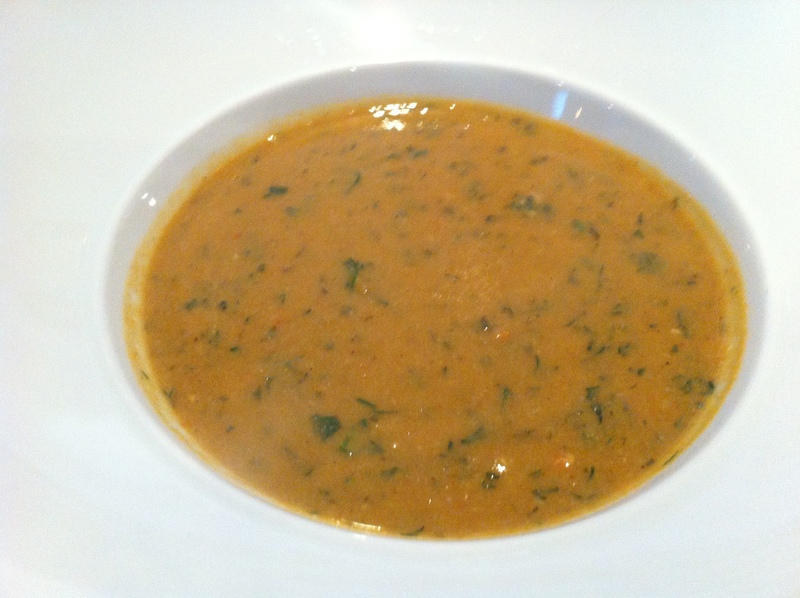 The soup, then, was fresh and hot, with a slight fishy (but in good way) quality. The dash of dill set off the flavors. Occasionally you’d be favored with a chunky bit of perhaps lobster meat, but a bite-sized chunk – don’t think you’ll be pulling whole claws out of it. The bree was a kind of chowder, with a heft, a stick-to-your-ribs affair. Frankly I was a bit concerned about having enough room for my main after the bree, since I’d had a late breakfast a short while earlier. The florie was equally fresh and delicious. The missus ordered the florie, which is a kind of cream cheese. It was served with notes of blackberry and onion. 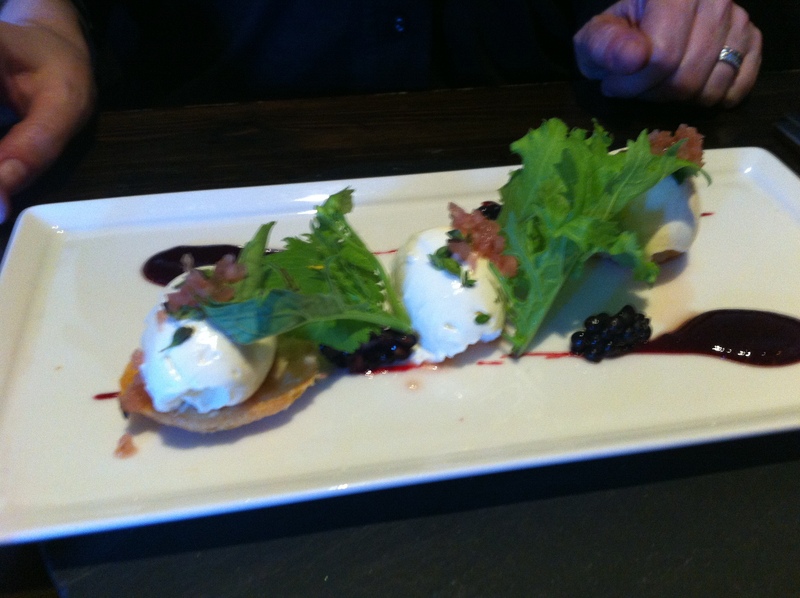 Flavorwise, it reminded me of how you might serve caviar with creme fraiche and chopped onion, sans the caviar. That may look like a small plate of venison, but boy oh boy it was more than enough. 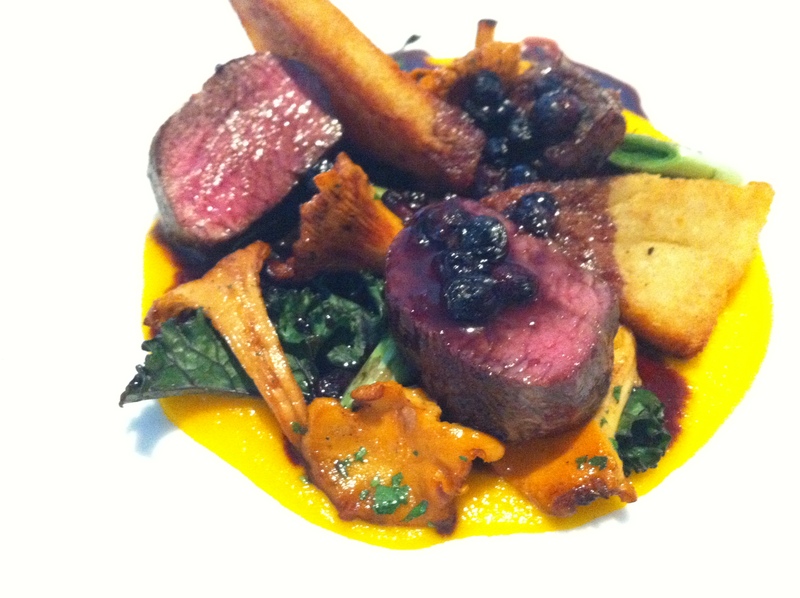 For the main it was two preparations of venison, saddle and haunch, with fresh mushrooms and berries. The mushrooms were again plucked from their back yard, essentially. The venison saddle, I believe, was prepared in the medallion form. The haunch, however, was slow cooked into a near brisket-like texture. The richness of the mushrooms, the gamey note of the venison, the depth of flavor in the brisket-like preparation, all of those wonderful flavors popped against the succulence of the berries… . What was it like? It was like biting into a forest that has a fresh breeze blowing through it. It was like eating Autumn. If Scotland had its own contemporary king, this is what would be served in his court. It was insanely delicious. I don’t know much about traditional Scottish fare. I suppose they are best known for smoked fish and haggis. But I think of this as 100% pure straight Scottish fare taken to the bazillionth level. Everything was so fresh having come from “just over there,” the preparation so expert… the whole meal was completely unlike any I’d had at any other fine dining experience anywhere else. It was an utterly memorable and delicious experience. On balance, I’d say it was one of the best meals I’ve ever had, because the whole package is so remarkable. The food, getting there, Skye itself. Put it all together, magic. Heck, each one of those ingredients is magic in itself. Combined, it is the stuff of life. So I guess what I’d say is if you win the lottery, or are a mogul, or have the ability to do whatever you want, I’d probably add this place as a “must go” to your bucket list. Again, the total experience, especially for a cityfied native New Yorker, was utterly exceptional – as was the food. I highly, highly recommend it. 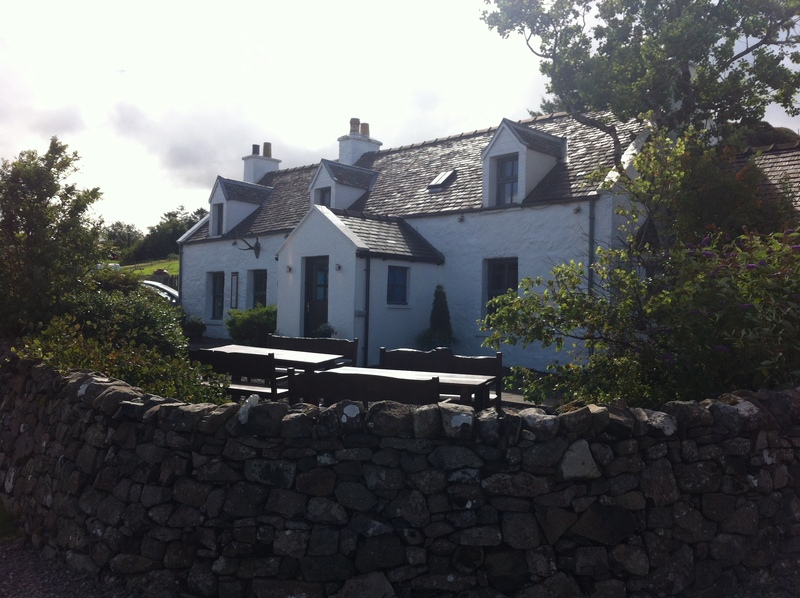 It would be ridiculous to go all the way to Skye and not eat here. Great post. 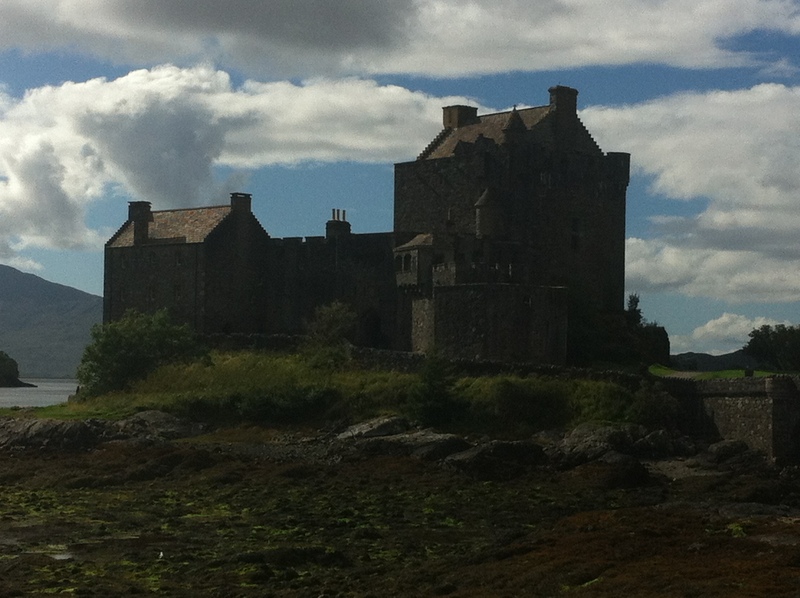 I love Scotland, been there 4 times. Your Gaelic needs work however. The correct phrase for your “Me like eat” I believe would be “Is toil leam ag ithe” (iss TOLL-lum uck-EEhuh). The word “Mar” does not mean “to like” as in “to enjoy,” but rather the word “like” as in “such as”. “Rudegin mar sin” means “something like this,” for example. Better Gaidhlig scholars may wish to further improve this translation. So A+ for the post, D- for Gaidhlig studies. Gesundheit! More seriously, your Gaelic corrections are much appreciated.